First row, l-r: Charles Chadwell, Eugene Saydus, Norman Evans, John Wirt, O'Toole Fazio, Sam Romeo, Rudolph Vass, Ray Foy, Bob Groseclose. Second row: Lois Foy, Margaret Green, Alva Gilmer, Lucille Taylor, Margaret Vass, Geneva Denny, Mary Alice Leedy, Pauline Nance, Marie Belcher, Hildred Carper, Vera Stone, Rosalie Calle, Archie Chaffins. Third row: Ted Leedy, Elso Peduzzi, Ray Pomeroy, Louise Leffel, Margaret Walker, Edna Sharrett, Sadie Burkes, Eleanor Quattrone, Virginia Crockett, Lucille Bearre, Elizabeth Hawthorne, Harold Mullens, George Arnold. Fourth row: Bernard Gottlieb, Earl Jones, Volga Farley, Dorothy Booth, Nick Camicia, Klegget Gordon, Fred Moore, Ruth Kaufman. Fifth row: Seldon Morgan, James Wright, Harold McComas, Howard McComas, Charles Southern, Otis Linkous, and Bill Harris. First row, l to r: Roy Goodson, James Early, Carl Rutledge, Felix Sinicrope, Tony Casali, Newton Harman, Milton Crisp, Carlo De Felice, Julian Leedy, Glenn Mee, Pete DeFuria, Gordon Hurd, Harry Odom. Second row: Zelpha Sexton, Anna Stanceo, Betty Barrett, Helen Paynter, Verla Ashworth, Agnes Cunningham, Betty Smith, Louise McBride, Anna Legato, Ruby Sheridan, Mary Roncella, Edra Webb Michaelson, Lucille Thomas Belcher. 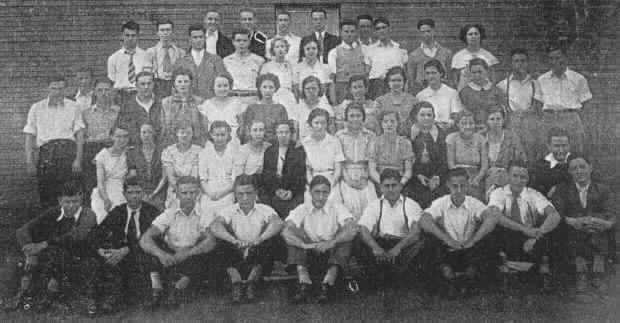 Third row: Bob Sult, Estil Parker, Viola Saydus, Bernice McCoy, Irene Cook, Anna Sue Hollandsworth, Jakie Barrow, Ralph Daugherty, Paul Marshall, Cordalene Daniels, Sue Sisk, Exer Johnson, Lorraine Richardson. Fourth row: Raymond Daugherty, Mary Knight, Raymond Stanley, Angie Miller, Regina Cosgrove, Fay Hollandsworth, June Rouse, Charles Bright, Ruth Bivens, Edith Courtney, Elbert Shumate, Paul Sells. Fifth row: Roston Barrett, Sanford Gross, James Bright, Ruth Hurt, Donald Pierce, and Willie Koven. l to r seated: Myrtle Belcher Roberts, Pauline Nance Hawthorne, Betty Smith Stoker, Geneva Denney Rae, Louise Leffel Wallace, Edna Sharrett Hurt, June Rouse Mooney, Helen Paynter Wilson, Elizabeth Hawthorne Bartley, and Irene Cooke Latham. Second row, l to r: James Paynter, Elbert Shumate, Charlie Southern, Julian Leedy, Otis Linkous, Emanuel Katzen, Donald Pierce, Margie Werrell Perdue, Mary Frances Kirchner Sult. Third row, l to r: O'Toole Fazio, Carl Rutledge, Charlie Bright, Raymond Daughtery, William Harris, James Early, Robert Sult, James Bright, Newt Harman III and Earl Jones. Attending but not pictured were: Edith Courtney, Mary Alice Leedy Sells and Paul Sells. Thanks to Bob Sults, WHS '34 for sharing these photos with us.